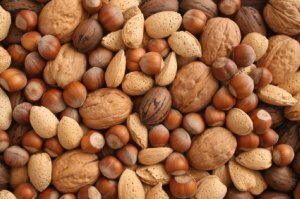 Nuts are a very important part of a healthy and well balanced raw food diet. Since they are a very dense food and contain a large amount of fat, they should be eaten sparingly. It’s quite easy to take in far more calories than you thought when snacking. It's best to measure out what you intend on eating and set the rest aside so you know exactly how much you're consuming. Like fruits and vegetables, they were probably one of man’s original foods, at least from the time when the climate began to change and migration took place. They need to be stored carefully as they can become rancid and quite harmful to our good health if they have over exposure to air and or heat. I keep mine in mason jars in the fridge, or if still in the shell in a cool dry place. If we compare them to animal flesh in terms of protein we find that they are an excellent form of protein that are easily digested after soaking. Digesting them doesn’t create any uric acid or urea, two byproducts of digestion of meat that create havoc in the human body. These days it’s very important to check to see if the “raw” almonds really are raw. In California, all of the big almond producers have to pasteurize their entire crop through one method or another. Small farmers that sell at farmer’s markets are not subject to this law thank God. Macadamia and pine are the only two on the list that don't need to be soaked overnight to remove enzyme inhibitors present in the brown bitter skin. When blended and mixed with citrus juice you a wonderful nutritious salad dressing. A few soaked almonds in a green smoothie is an easy way to get them into your diet and will make your smoothie carry you even further. They're great chopped over salads or included in entrees and only your imagination limits the ways they all can be used. You’ll notice that peanuts are not on the list above. That’s because they are legumes. I don’t include them in my diet because they can contain a mold called aflotoxin, a known carcinogen. This is the end of this list. To see other lists of raw foods go to the links below.